Our optometry curriculum is a four-year, full-time program leading to the Doctor of Optometry (OD) degree. The curriculum emphasizes direct hands-on patient care in every semester beginning in the first year and continuing through full-time clinical rotations in the fourth year. The curriculum supports many different learning styles with modes of instruction including lectures, laboratories, clinical education, and service learning. Interprofessional educational experiences are incorporated within each of the four years. In the first year of the curriculum students from other WesternU health professions programs will be enrolled together in didactic courses, laboratories, case-based learning and service learning projects. An interprofessional service learning component is part of the first year curriculum which includes community-based projects such as outreach to elementary schools and senior citizen groups. The service learning course includes practical applications of health education, public health, epidemiology and biostatistics. Students from the different health professions will continue to learn together and from each other in the patient care setting, including fourth year rotations at sites where interprofessional patient care is provided. This curriculum provides an opportunity for early networking with other health professionals and ultimately prepares you to better serve patients through interprofessional collaboration and referrals. 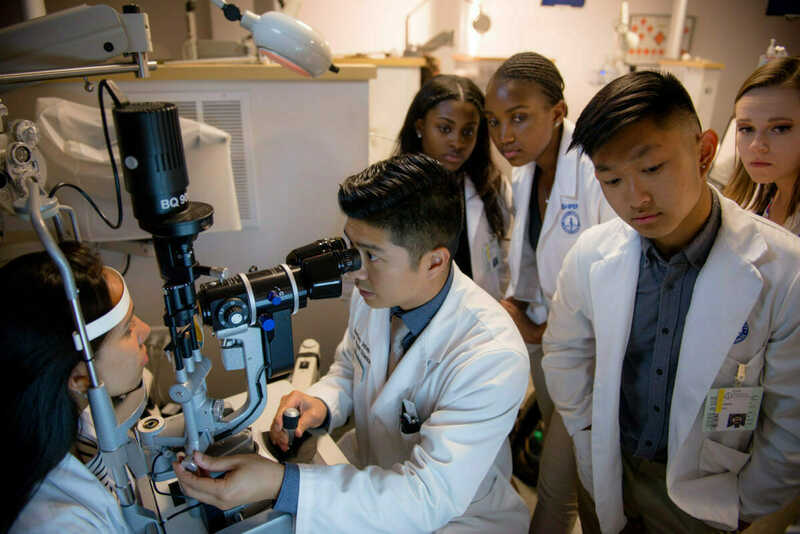 prepares you for entry-level optometry care along with a special emphasis on optometric rehabilitation, neuro-science and neuro-optometry. offers early and extensive clinical experience in community-based settings such as private practices, community clinics and hospitals. includes interprofessional education in collaboration with other health disciplines. You will learn and ultimately master advanced diagnostic techniques and clinical skills in Objective Structured Clinical Exams (OSCE) in which you will be assessed on your knowledge base and professionalism as well as technical, cognitive and diagnostic skills to ensure you able to provide patient care at its best. Upon graduation, you will be well prepared to successfully complete your national and state board examinations to become licensed to practice in the state of your choosing. Caring about students and helping them achieve is a hallmark of our faculty. They are respected practitioners and scholars who keep pace with the latest teaching techniques and technology and are committed to helping you master the material. During the fourth year, students broaden their clinical experience at mostly off-campus externship sites. Throughout these four quarters, students will typically rotate through four sites that will provide exposure to a variety of clinical settings that may include private optometry or ophthalmology practices, Veterans Administration clinics, Indian Health Service clinics, armed forces facilities, as well as WesternU specialty clinics. WesternU is a thriving academic health center spread out over 22 acres in Pomona, CA. The main campus currently includes 19 major buildings and construction is complete on two new building projects totaling an investment of more than $100 million. These buildings are shared by students in optometry, dentistry, osteopathic and podiatric medicine. The design fosters interprofessional education and patient care. In addition, a new seven-story, 600-space parking structure was built to serve the new buildings. Join us for information session where you can tour the facilities, chat with faculty and students, and learn more about WesternU’s OD curriculum and admission requirements.